WHY YOUR COMPANY SHOULD INVEST IN SEO? It is affordable compared to the costs related with other forms of digital marketing such as paid advertising. Good SEO practices enhance the usability of your website. Search engines winning more market share. We Help You Rank High! 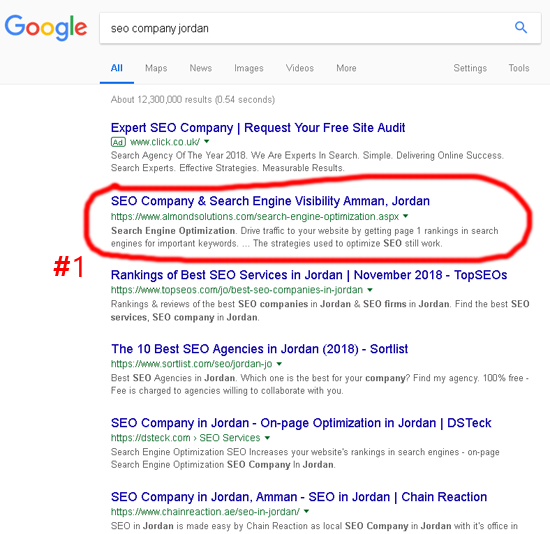 If you are looking for a professional SEO company in Amman, Jordan, contact us today. We can help you rank high on Google and Bing for the converting keywords that bring quality leads to your business. We’ll review your business, website, and competitors in an effort to provide clear details to be considered throughout all other phases of the project. We'll review, research, analyze and select the best keywords to target to drive qualified traffic from search engines to your website. We'll review page titles, website's navigation system, sitemap, ALT, META data, and clean up the code. We’ll optimize your website’s content in a way which is good for SEO - Google loves text, high volume, and high-quality content. We’ll review your target audience before going to implement a link building strategy in order to provide reasons to earn those links. We'll give you regular details which include analysis of campaign performance, as well as plan tracking and adjust work plan based on results. Why Does Our SEO Process Deliver the Results? We do not get involved in black hat practices that will deliver quick wins but end in penalties as well as cause damage on your well-earned SEO power. We put in the effort to stay up to date on the ever-changing SEO curve, giving ongoing coaching and effective improvement for all members. We focus on making use of ideal strategies that are designed to achieve both short and long term results, improving content as well as structuring website pages the way Google will love. Our SEO expert team is determined by perseverance and obstinacy, making sure we never leave opportunities on the work table. Does Almond analyze my backlink profile and clean it up for Penguin recovery? Yes, our specialist will analyze your backlink profile using professional tools and then identify the best ways of getting in contact with webmasters (sometimes we use disavow tool to remove bad links). After successfully working with webmasters to clean up your bad links, you will receive a detailed report about the link removal campaign. How does Almond find the best keywords for my business? First we’ll ask you to provide us with detailed description about your business activities and market, and ask you to suggest us your keywords list. Then, our specialist will analyze your suggested keywords list using professional tools in order to find out how many people are searching for these keywords and how many websites are competing with you for the traffic. After that, you will receive a detailed report about your suggested keywords and recommendations for the best results. The website with a huge content could possibly see results in a couple of days compared to websites with a few content. Does Almond offer offshore outsourcing services? Yes, our company offers a variety of offshore outsourcing services to global companies of all sizes including Jordan that cover search engine optimization, social media marketing, PPC management, internet marketing, website design & development and more. Outsourcing us will definitely save your time and money. At Almond, if the customer wants to deal with SEO as an investment, then the word “COST” will be ignored and instead of, we partnership with him to create a solid plan and strategy for the SEO project in order to get a high ROI. But, if the customer focuses on “COST”, we’ll charge a rate based on keywords that need to be optimized. Does Almond offer conversion rate optimization? Yes, having a presence in the top positions (in search engine results page - SERPs) for the keywords the user is searching for is perfect to drive visitors to your website. But this does not mean the visitors will be converted to leads. On the other hand, the visitors will be converted to leads if the landing pages are fully optimized, and the science that cares about this is called conversion rate optimization. We're here for one reason: to help small businesses succeed online.